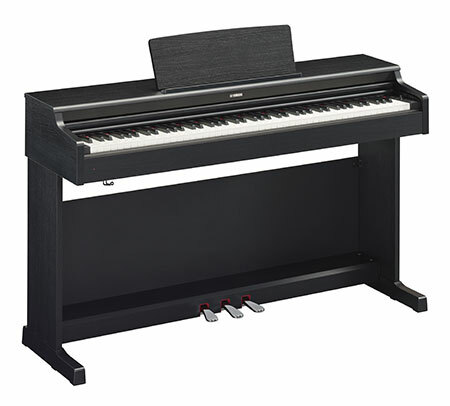 The Yamaha YDP164 piano is a modern design digital piano offering a compact style, high quality piano sounds and integration with the incredible Yamaha Smart Pianist app. 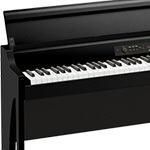 It makes use of the renowned GH3 (Graded Hammer 3) effect keyboard offering an authentic piano playing experience. 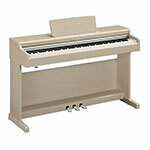 Combined with the latest technology and sounds, the YDP164 is the ideal piano for the beginner and developing musician. 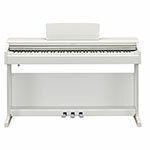 The piano sound of the YDP164 is taken direct from the famous Yamaha CFX grand. 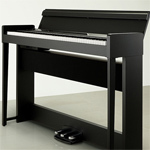 9ft Of stunning grand piano sound projects from the compact cabinet of the YDP164. The sound is clear, warm and makes you want to play. 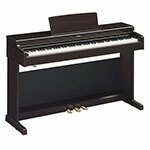 Based around their own piano design, the GH3 (graded Hammer) action offers a truly authentic piano touch. It is slightly heavier in the bass range and slightly lighter in the upper range. The 3 in the GH3 signifies 3 sensors. Normally 2 sensors are used to check note and velocity but the added sensor allows rapid re-trigger of the note without having to fully release it before playing it again. The piano touch also has a trick up its sleeve; The felts are specially designed and offer cushioning to absorb the impact of the key when pressed. This reduction in vibration eases stress on the fingers and forearms making playing for longer periods much easier. When you adjust the volume on a digital instrument the tone changes and you tend to get optimum quality higher up the volume range. The IAC system in he YDP164 sorts this issue by automatically adjusting the bass and treble as you lower the volume, optimizing the sound output. While wearing headphones, the stereophonic optimizer creates the illusion of the sound coming from the piano so you can enjoy high quality realistic sound even with headphones on and without disturbing others. Smart Pianist is a superb app that offers tuition as well as navigation of the instrument and even shows you the chords to play along with your own song library! A set of educational books built-in to the app can get anyone playing and teaches them how to read music, about timing and is fun to play. But if you fancy playing along with your favorite music then the app can scan your music library audio files and works out the chords to play along with the song! This means you can get into playing your all time favourite music with ease.